Note: Undefeated in three starts. Broke his maiden at Gulfstream on Feb. 11, then won an allowance on March 11. 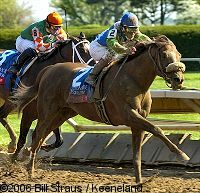 Came into the Lexington at Keeneland with no graded earnings and had to win to get in the Derby, which he did. Stalked the pace in the Derby but never really got into the race, finishing 6th.